Hello Spring! Here comes prom! A much-anticipated occasion in high school is P-R-O-M and with this comes finding the perfect formal attire and hairstyle. You want this evening to be perfect and memorable so choosing the right style for your short hair is imperative. There are endless formal hairstyles for short hair that will suit your style, so get ready to have fun with your short hair to make this prom night flawless! Got long hair? Check out our guide to long hairstyles for prom! The length of your hair. If your hair is above your shoulders, it is in the short hair category. Though you may not have the same length as some of your long-haired pals, don’t fret because there are still tremendous options for your hair. You may not be able to achieve some of the long, sweeping styles if your hair is not long enough to pin back, but working with smaller sections and incorporating braids and twists can help pull your hair up. 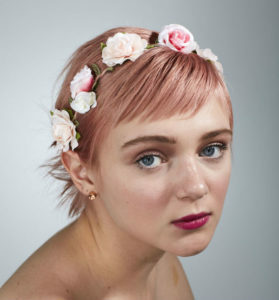 If your hair is significantly shorter than shoulder length, maybe a pixie of some sort, adding hair accessories or little braids, can give your short style a transformation for the night. 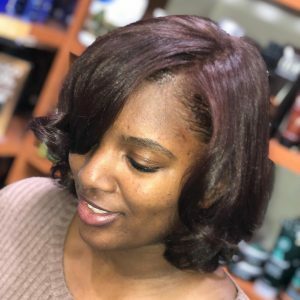 If there is a style you feel is a must-have but fear your hair isn’t long enough, there are many options from very temporary (clip in) to more “permanent” (fused on, which grow out with your hair). The thickness of your hair. 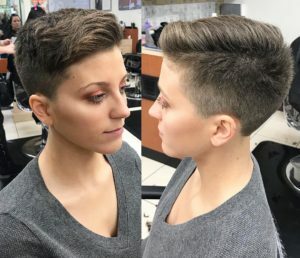 Try looking at photos of hairstyles that seem comparable to your hair thickness, though this can be a little hard when you’re viewing styles that are all done up. This sense of comparison will really help your hairstyle be the best it can be and keep your expectations reasonable. This is another area where extensions could benefit you if you really want to add bulk and volume for your desired appearance. 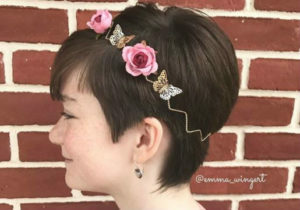 If your hair is at the longest point for what is considered short—just above the shoulders—you have a few more options because it may still be possible to pin all your hair up. Some beautiful styles are made to look full and lush with hair being freely pinned around the back of your head. 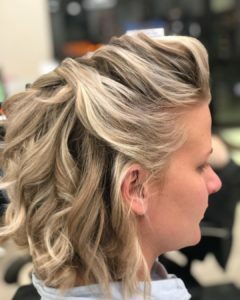 Though a bun or gathering may not be possible, adding texture with curls and teasing then working with those curls for perfect placement will give an illusion of more hair because a style of this sort can look quite elaborate. There may be some loose front pieces that can add a nice softness; however, if you do not want any face-framing pieces, twisting or braiding these toward the back will help keep them from falling. Hair falling about chin-length can start to get too challenging to pin all up because it would be too short around the nape of the neck (or around your hairline). This is when you might still be able to achieve a really gorgeous half-up style, assuming you do not have short layers. When choosing a half-up style, you need to decide two things: 1) how you want the hair left down to be styled—straight, wavy or curly, and 2) how you want the hair up to be gathered. It could come to one center in the back if allowed by length or be pinned in less precise areas to give a soft, whimsical appearance. One popular style which works on any length hair is the finger wave, though it looks exceptionally nice on this length. Often, this style is done with the hair all down, a defined part and the finger wave lying boldly along the face and through the lengths of the hair. It allows for a classic, elegant look that is different from the everyday. Pixies range from very short to a bit grown-out but cannot be pulled back in the same fashion as slightly longer locks. Depending on your overall length, a fun look to create is a faux hawk by doing small, tight braids horizontally along the sides (or one side for asymmetry) and adding considerable volume on top. Though this may be a little bold, it would be a show-stopper. If something a little more subtle is your taste, or your cut is too short for this, try adding volume or create a slicked look (whichever is opposite of your daily style for something different) and add a hairpiece. This could be a full headband or something that clips into one area. It could have flowers, gems, or whatever goes with your look for the night. Whichever style you’re hoping to achieve, a fun and easy way to add a little pop to any short hair prom style is to move your part. Wearing your part differently will add volume at the part and enhance the look. If you usually wear to the side, try the opposite side or down the middle. Or, opt for a really severe side part. No matter the length of your short hair, there are great options to make your short prom hairstyle perfect. Remember to bring your favorite hair inspiration photos to your appointment at Hair Cuttery, then relax while your stylist creates a masterpiece!